The inaugural Puppy of the Month selection, slated for reading and discussion in September 2016 is Brian Niemeier's Nethereal (available here at Amazon.com). Described as "space pirates in hell"...that's all you need. Space pirates. In hell. If you're not already sold on this book, then maybe the Puppy of the Month club isn't for you. This book is the first in the Soul Cycle series, and if you pick up a copy to read for the Club, then you should also get the second book in the series, Souldancer. It's available for free through Amazon this week (link). That's two books for the prices of one! Brian Niemeier was nominated for the 2016 John W. Campbell Award for Best New Writer, where alongside legendary sci-fi author Jerry Pournelle, he earned the distinction of placing behind No Award. In short, he is disliked by all the right people. To join the Puppy of the Month club, all you have to do is read Nethereal some time over the next couple of weeks, and submit a blog post detailing your thoughts on the book. Alternatively, you can wait for others to post and just join in the comments. As things stand, you're reading the only official Contributor for blog posts, but we'd love to have more. If you're interested, leave a comment, or contact me via Twitter. Thanks, Jon! 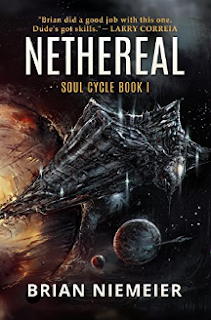 I'm proud that Nethereal is the first Puppy of the Month selection. Im gonna load this as soon as my ereader comes in.